Whilst advances in reproductive medicine have enabled thousands of couples worldwide to have children, they also raise a plethora of ethical, philosophical and legal questions. This collection of essays by leading international scholars in bioethics, law, philosophy and public health, addresses many of the most difficult and intriguing issues. These include: the nature and scope of the right to reproduce, the meaning of parenthood and family, the significance of genetic connection to parenting, non-traditional families, sperm and egg donation, commercial surrogacy, prenatal genetic testing, reproductive cloning, obligations to children of reproductive technology and post mortem insemination. 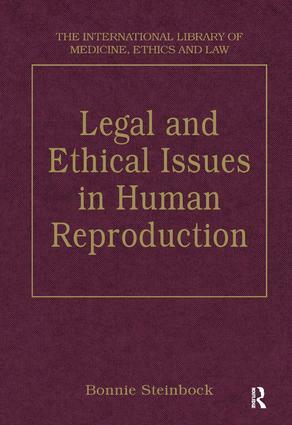 Legal and Ethical Issues in Human Reproduction is an important contribution to the growing literature on reproductive technology and one that will be of value to scholars, practitioners and students alike. Contents: Procreative Liberty and Assisted Reproduction: Embryos, families and procreative liberty; the legal structure of the new reproduction, John A. Robertson; Regulating choice: a constitutional law response to Professor John A. Robertson's Children of Choice, Ann MacLean Massie. Assisted Reproduction and the Family: What does it mean to be a parent? The claims of biology as the basis for parental rights, John Lawrence Hill; And Baby makes 3 - or 4, or 5,or 6: redefining the family after the reprotech revolution, R. Alta Charo. Contractual Reproduction: Gamete Donation and Surrogacy Arrangements: Bioethics and fatherhood, Daniel Callahan; Legal issues in human egg donation and gestational surrogacy, John A. Robertson; Surrogate motherhood as prenatal adoption, Bonnie Steinbock: Markets in women's reproductive labor, Debra Satz; Prenatal genetic testing and screening: constructing needs and reinforcing inequities, Abby Lippman; Ethical issues and practical problems in preimplantation genetic diagnosis, Jeffrey R. Botkin; 2 models of human cloning, John A. Robertson. Limits to Procreative Liberty: Sterilization of mentally retarded persons: reproductive rights and family privacy, Elizabeth S. Scott; Harming future persons: obligations to the children of reproductive technology, Philip G. Peters; In the name of the father? Ex parte blood: dealing with novelty and anomaly, Derek Morgan and Robert G. Lee; Name index. Bonnie Steinbock, has been at SUNY-Albany since 1977. Previously taught at The College of Wooster. Fellow of the Hastings Center. Author of over 50 articles.